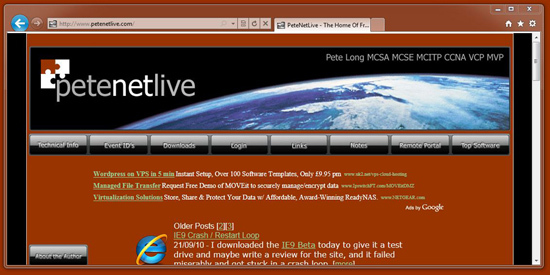 The IE9 Beta came out a few days ago so I thought I’d take a look, bad news for Windows XP users as you can only run it on Vista and Windows 7, download it here. 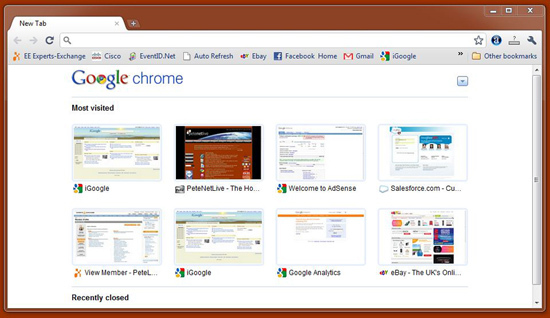 I used to be a dyed in the wool IE user, and wondered why on earth anyone would want to use Firefox, Chrome, Opera, etc. That was until I actually installed and started using Chrome. 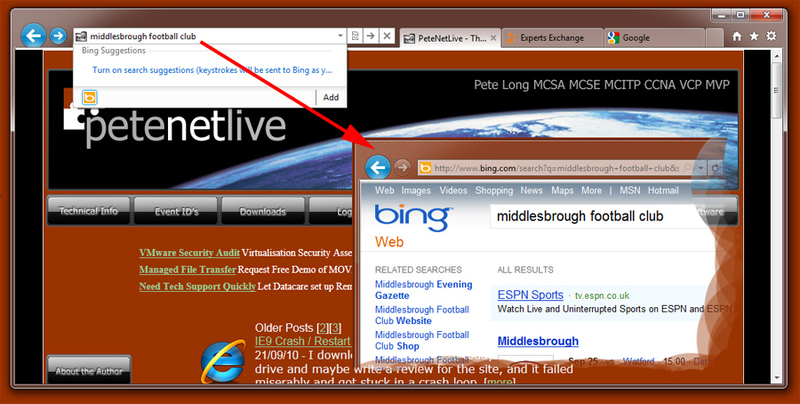 The fundamental problem I have with IE is, its function in life should be to show me web pages. 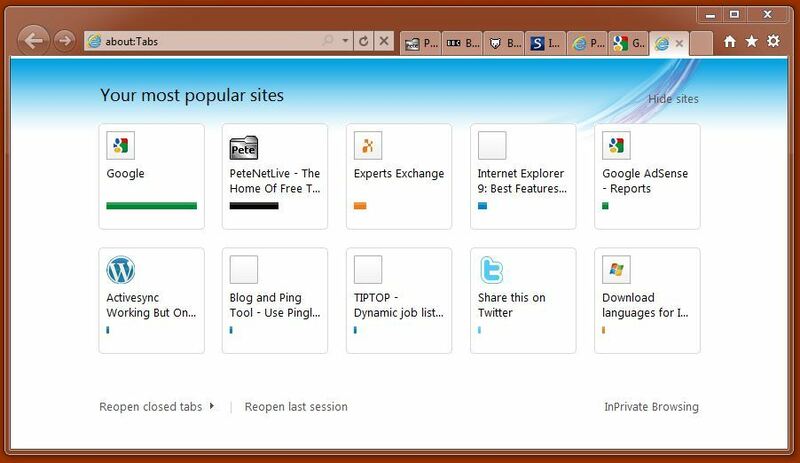 At some distant meeting at Microsoft in the past, some ginger haired code monkey cretin decided that the browser would be able to do all sorts of stuff like Windows Explorer can. Cue years of code exploits, holes that needed to be patched and general scorn being heaped upon IE. 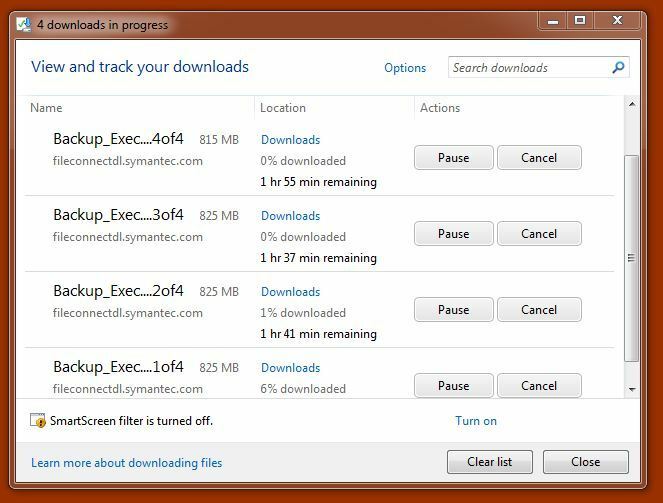 Download and Install: Easy to find – and installs pretty quick – then asks for a reboot (why a browser install needs to reboot the entire OS! – I’ll tell you why, read the second paragraph on this page). First Run: Crashed and fell over, took me over an hour to fix. First Successful Run: Looks nice and clean very "Chrome-esque". In fact, hang on a minute! It looks VERY Familiar indeed! In fact is looks exactly like the browser that was in the Longhorn Beta 6 years ago? 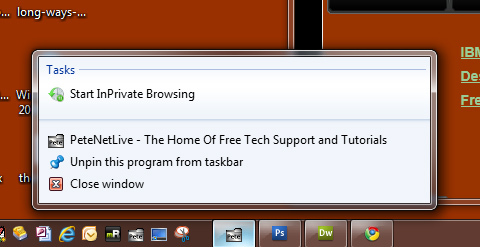 except they dropped the tool bar and added tabbed browsing. Its not remembered any saved passwords but prompts me to save any newly entered ones, again this is nice, clean and simple. But will be a problem if you’ve forgotten any usernames and passwords your browser enters for you. 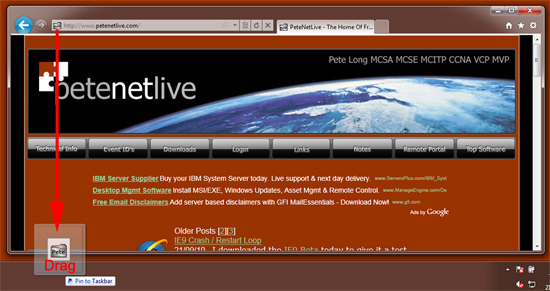 Integrated Address and search bar. Thumbnail tabbed viewing – Though touted as a new feature this has been with us since IE8. The difference is now you can embed code and controls in the thumbnail tabs. 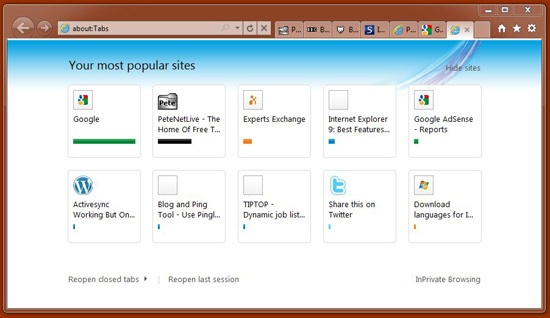 Pin to Taskbar – You can now pin individual sites to your Windows taskbar. Each site will retain its own icon (if it has one), and its own jumplist. Despite my flippant remarks above, IE9 is supposed to be fully HTML5 compliant and uses hardware acceleration. I’ve seen some benchmarks that claim that it will even out perform my usual weapon of choice (Google Chrome). I want this to be a much better browser than its predecessors but I’ll run with it for a while to see if it converts me back. 1. Bad: The Lightbox links on my web site don’t work – there’s some Java-ness it does not like. 2. Bad: By default the tabs go next to the address bar – that’s fine but more than six or seven tabs open and they get a bit too small – if there is a way of unlocking and moving things its not simple to find. 3. 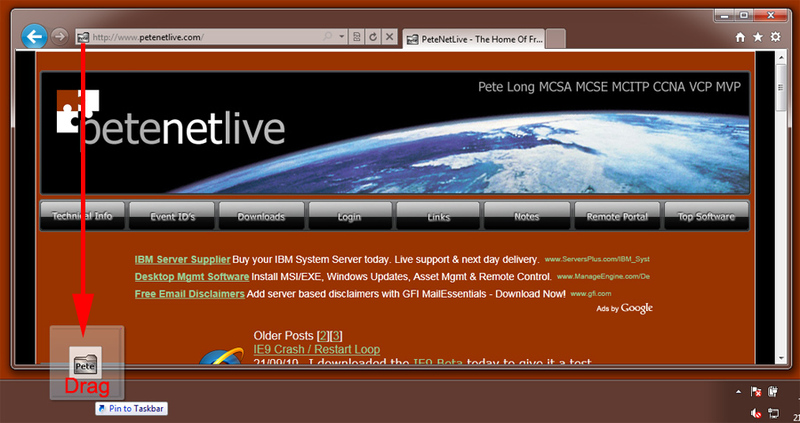 Good: The php stuff on my site seems to work OK.
4. Good: Dragging tabs away from the browser spawns separate browser instances (like Chrome), and combined with the Windows Aero snap feature, its easy to stack sites side by side. 6. Good: The new tab page is very much like the Chrome one, this was the one feature I was missing while using IE9, the Microsoft one does not look as nice, but it does the job. 7. Bad: Close Tabs to the Right/Left is not on the tabs "right click menu", I use this a lot while in Facebook, close other tabs is there, but I might not want to close all the other ones. 8. Bad: Flash support? 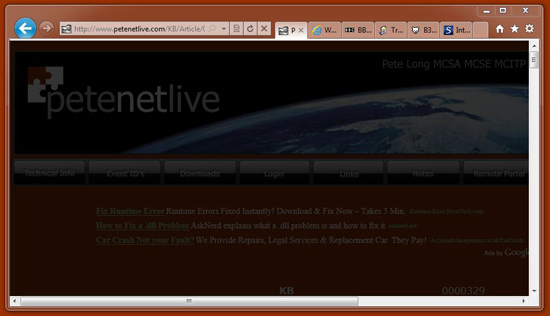 what flash support, cant see any of my YouTube videos, or my corporate web site that’s built entirely in flash. (Before you email in – yes I’ve installed Adobe Flash 10 with all the latest updates). 9. Good: I Like the new download manager very Firefox/Chrome like. 10. Bad: Any Java related download manager software does not appear to work.